A lot of you might already know that Google announced the release of Google Ad Planner. This free media research and planner tool allows advertisers/agencies to find the Web sites that match their desired target audiences so that they can decide where to spend their advertising dollars. This tool along with other tools such as Google Analytics Benchmarking, Google Trends for Websites positions Google well in competition with Nielsen , Quantcast, Hitwise and Compete. I got my account to Google Ad Planner last week and I can tell you that I was impressed. Yes, there are a lot of features that are not there yet but nonetheless this tool is pretty powerful. Using this tool you can find smaller sites to advertise that you would normally not look at. When you first enter the tool it show you how many total Unique Visitors and Pageviews that you can reach (that is total internet usage) if you advertised on the whole internet. Then you can choose specific country and/or language to narrow down your target audience. Next you can enter any demographic information to further narrow down your target audience. The demographics that are available are gender, age range, education and household income. Below is the description of this filter from Google Ad Planner Help. Choosing any site below means any internet user in the sample set who meets at least one of the criteria will be included in your audience. Choosing all sites below means internet users in the sample set must meet all of the criteria in order to be included in your audience. For example, if you specify 'Site A,' 'Site B,' and 'Site C' as sites your audience is likely to visit, then select the all sites below filter, only internet users in the sample set who visit all three sites will be included in your audience. If, however, you select the any site below filter, an internet user in the sample set who only visits Site A and Site C will still be included in your search results. Another filter option is to limit your audience to only those sites that are in Google Content Network and the ad sizes these publishers support. This option is very useful if you are limited to using Google Adwords for your media buys. Apart from Media planning, this tool can be used to do competitive analysis. For example, it can show you what percentage of your users also go to your competitor’s site. It can show you what other sites your competitor’s visitors visit – Good for analysis and then planning your media buy. It can show you the demographic mix of your competitors visitors. 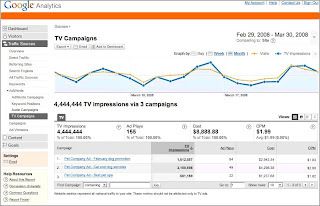 Like Google trends, Google Ad Planner needs to be integrated into Google Analytics. Microsoft Gatineau overlaid some of the demographic data into the web analytics reporting, Google just showed you that they have that data too, plus some more. So it is matter of time when this data will be available in Google Analytics. Google started using its Monopolistic Powers? Do No Evil? On Monday, I wrote about Google Trends for Websites, a tool that lets you trend and compare unique visitor counts for websites. It combines data from variety of sources, such as aggregated Google search data, aggregated opt-in anonymous Google Analytics data, opt-in consumer panel data, and other third-party market research. Remember, a while back Google asked you to opt-into data sharing in Google Analytics, this is one place where your data is being used. If you don’t want your site to be listed in this tool because you don’t want you competitors to know how you are doing, then how do you opt-out? Let’s assume that you are using Google Analytics and have opted-in to Google Analytics Data Sharing. In that case Google should be using your Google Analytics data to show your site starts in Google Trends, that is more accurate than any other kind of data (well sort of). So if you do opt-out from Google Analytics data sharing, Google will revert to other sources of data e.g. toolbar, Google search data etc, which means you will still be listed in Google Trends for Websites. The only way to completely remove your site from Google Trends from websites is by opting-out of Google Search engine by using a robot.txt to not let googlebot crawl your site. Remember, by doing so you will probably loose a good chuck of you traffic, traffic that comes via Google search engine. And why would you do that? In other words, you don’t have a choice. You are opted-in in Google Trends for websites by default and you have no way out. (Note, even if you could opt-out of Google Trends, competitors can still find out about your traffic etc using other services such as comScore but this one is Free so makes your data widely available). On the other hand Google Properties such as Google.com, Orkut, do not have to follow the same process. According to Google, "We do not show Google.com properties on Trends for Websites. We have policy of not providing interim financial guidance, and have decided not to release Google numbers in accordance with that policy." Hmmm...what about other companies? Should Google not respect their policy? Now won’t you call using (abusing) your monopolistic power? Google has released a new tool called Google Trends for Websites to compete with the likes of Alexa, Compete, Hitwise, Comscore Nielsen Net Ratings. This is exactly what I predicted in my blog post on April, Friday the 13th, 2007. I wrote, "Another effect of the widespread code of Google could be the death of companies like Alexa, Compete, Comscore etc. Google can provide the internet usage data that won’t be based on a sample of those who participate (voluntarily or by installing some kind of application such as a toolbar) but on the Google cookies which will be on almost every single computer connected to the internet." I also said, "However, this business might not be so lucrative for them. Why would they want to let others know how people use internet when they can use it to make it Googlenet (formerly known as internet) or GWW - Google Wide Web (formerly know as World Wide Web).” I think this business might not make them money but will help them dominate Word Wide Web and make it Google Wide Web." So how does Google Trends for Websites work? Google Trends for Websites allow you to trend and compare number of daily unique visitors for up to 5 sites. Below is a screen shot of Google Trends for Websites. I compared Walmart.com with Amazon.com. Other websites that they have also visited. The list shows a correlation between different sites. You can breakdown the data by region and time frame. Are all Sites Included in this tool? Just like other similar service (Compete, Alexa, Comscore etc. ), Google Trends numbers won’t match the number you will see with your web analytics tool. However, considering the number of sources that Google can potentially collect and aggregate data from, in future this might provide the best approximation, totally outdoing other competing tools. Integration of Google Trends with Google Analytics, so that you can get competitive information in one place. A service for website owners to collect “Voice of Customer” data - surveys, opinions etc. (Watch out OpinionLab, you are next) This service will enhance Google Services such as Search (page rank algorithm), Google Trends and Google Analytics. Death of ISP based Behavioral Targeting? Last month Charter Communications, an internet service provider (ISP), announced that it will share it's customers web browsing data with NebuAd, to show ads based on customer’s web browsing behavior. NebuAd has developed a product know as “deep-packet inspection boxes” for ISP to track user behavior online and then serve ads based on these behaviors. Since announcement, Charter Communications have come under pressure from privacy advocates and Congress. According to an article in Mediapost, Charter Communications has now delayed its plans to start sharing information with NebuAd. I wrote a blog post on NebuAd when I first heard about it. In that post I talked about the privacy issues that ISP based BT raises.There has been a lot of concern regarding privacy of user when it comes to Behavioral Targeting. ISP based BT raises this concern to even a higher level. I wrote: "This kind of technology is beyond simply using anonymous tracking. ISP do have a lot more information than just the browsing behavior. They have name, location, age, social security number (SSN). They know what time users login to their machine, when is the internet being used, what kind of sites are visited at what times, which sites provided information before a user made a purchase etc. etc. This is far more information than companies like Revenue Science or Tacoda has." "Below are a couple of quick points from NebuAd’s CEO Bob Dykes to explain and clarify some of the information. Since NebuAd and the partner ISPs do not exchange data, the ISPs do not see the categories each random number visits, and NebuAd does not receive specific customer information, so there is no way for either NebuAd or the ISPs to match specific customer information with even the categories of information associated with the randomized numbers. NebuAd also does not retain the raw data mapped back to the anonymous user profiles." Control Protocol on Internet Protocol (TCP/IP). In doing so, NebuAd commandeers users’ Web browsers and collects uniquely identifying tracking cookies to facilitate its advertising model. Apparently, neither the consumers nor the affected Web sites have actual knowledge of NebuAd’s interceptions and modifications. NebuAd exploits several forms of “attack” on users’ and applications’ security, the use of which has always generated considerable controversy and user condemnation, including browser hijacking, cross-site scripting and man-in-the-middle attacks. These practices -- committed upon users with the paid-for cooperation of ISPs -- violate several fundamental expectations of Internet privacy, security and standards-based interoperability. Moreover, NebuAd violates the Internet Engineering Task Force (IETF) standards that created today’s Internet where the network operators transmit packets between end users without inspecting or interfering with them. For example, the TCP protocol would normally not accept code from a source that is a third party from the client-server connection. NebuAd engages in packet forgery to trick a user’s computer into accepting data and Web page changes from a third party like NebuAd." In March, three British ISPs got into a similar controversy and now NebuAd. Is this the death of ISP based behavioral targeting before it even got started? We will have to wait and see. For now, it looks like that for ISP based behavioral targeting to live it will have to prove that it is not doing anything sinister. I have said time and again that BT companies should ask explicit permission from user i.e. they should ask them to opt-in instead of automatically opting them in. As you might already know that IndexTools, a web analytics tools that claims to offer 80% of the functionality of omniture, was acquired by Yahoo in April. Within few days after the acquisition, Yahoo announced that it will be giving away the tool for free. 2 months went by but there were no sign of Free IndexTools. Well, last week Yahoo announced that IndexTools is available for free but it is not freely available yet. At this time, all the new account activations will have to go through existing IndexTools partners. IndexTools is limiting new accounts to ensure they have proper infrastructure and capacity to handle new accounts. We here at IndexTools are now pleased to announce that the ‘Add New Account’ function has been reactivated on your partner account, but with some limitations. Please bear in mind that our current server capacity was based on our original projections according to where IndexTools expected to be in 2008 in regards to volume and revenue. The acquisition by Yahoo! rendered this forecast obsolete. Our number one responsibility is to ensure that our existing partners and clients are not negatively impacted by an oversubscription of accounts on the IndexTools system. These limitations will be reviewed in the coming months. So, what are these limitations? ZeroDash1 is a partner of IndexTools and that provided me an opportunity to get free accounts. I have implemented the code on one of my customer sites and will be sharing my thoughts about free Y! IndexTools in coming weeks. Y! IndexTools - Add New Web Analytics Accounts Feature reactivated! WWE is a Billion Dollar Sports & Entertainment Company located in Stamford, Connecticut. Serve as internal subject matter expert on the reporting tools and metrics by providing information on best practices, benchmarks, key performance indicators, etc. Tracking and comparing traffic drivers and usage trends and recommending site enhancements where appropriate to improve user experience, increase traffic, online sales and overall value to marketing and advertising partners. Work with marketing, e-commerce, business and creative teams to understand their reporting needs, design reports to meet the requirements and work with colleagues to make sure the reports are properly interpreted and used. Respond to ongoing internal customer requests for data and analysis. Provide leadership in Search Marketing area. Provide training on how to interpret and use data for business analysis. Google Collecting Data on 3rd Party Sites to Target Ads on Google.com? Is Google collecting data on the 3rd party sites to target Ads on Google.com? A user called "Discovery" on Search Engine Watch Forums reported that Google showed targeted ads (sponsored search results) on Google.com based on this user's behavior on 3rd party sites (Fry's, Circuit City, HP.com and Best Buy). “As far as I knew Google's PPC was strictly KW search based, then an odd thing happened yesterday. Without going to Google I had visited Fry's, Circuit City, HP.com and Best Buy looking for a PC for a family member. After some research on these sites I decided I wanted to look at some comparison engines. I opened up a new browser window and went to Google, I did a search for "Comparison engines". My results were very interesting. Instead of a generic list of comparison engines touting to find the best prices for all products all the advertisements were related to PCs! Specifically HP PC's! I had not done a search on Google at any time for PCs, or on their shopping site. Is Google using behavioral targeting already? I had heard there were announcements that this would happen with the acquisition of DoubleClick, but I have had no notice that it was in practice? I have written quite few blog posts on this topic and have always believed that Google will get into Behavioral Targeting sooner or later. It started “in-session” behavioral targeting on the Google search engine, which uses a user previous search query and combines with current query (both in same session) to provide sponsored results on the SERP (search engine results page). Companies such as Best Buy, Fry’s, etc share their data with Google and allow Google to tie the users behavioral data collected on their site with other data that Google collects about those users (using a common cookie or some other common identifier). For this kind of data sharing to happen, Google (or Doubleclick) code has to be implemented on the pages (or servers) on those sites. I did not find any code, but it is possible that the code is there because if these sites are doing online advertising using Doubleclick then they must be putting the code to measure the success of these online ads. However, I highly doubt that they will let Google (Doubleclick) use the data collected on their site to power Google Search results unless Google is using the data to put their ad in front of users. Think about this. Why would Best Buy allow Google to use its data and allow it to show Circuit City’s or some other competitor ad? Google collects this data via a toolbar or some other application that tracks user across the sites and on search engines. This brings up few more questions. Who owns the data? It is up for debate. Is it fair to Best Buy or Circuit City or any other site owners? That is a question that needs a bigger discussion. Does Google has power and scale to collect data across sites and do targeting? Absolutely. Yahoo has signed a deal with Wal-Mart under which Yahoo will start selling display advertising on Wal-Mart. Yahoo will use the behavioral data collected on Wal-Mart's website to better target the ads, a practice known as behavioral targeting. As I understand, Wal-mart will use yahoo for serving behaviorally targeted in-house ads (and products) and behaviorally targeted 3rd party ads. Side note: I believe that in near future all of the eCommerce sites will have some version of on-site behavioral targeting. eTailers (Online retailers) cannot put generic messages and products in front of customer and expect the conversions to go up. They will have to understand what customers want (or need), where customers are in their purchase decision and put relevant messages and products in front of them (more on that later). Wal-mart's latest foray into online classifieds (IMHO they should have built their own classifieds instead of using oodle.com) and now deal with Yahoo to sell targeted advertising is the beginning of a long list of offering that Wal-Mart will roll out as a part of their online strategy to compete with Amazon, eBay etc. I am including this chart to show how traffic to Walmart.com compares to Amazon. It will be interesting to see how Amazon and Wal-Mart compare to each other after Wal-Mart moves forward with its online strategy and rolls out new offerings. Note: Wal-Mart uses oodle.com to power its classifieds; the traffic Wal-Mart will get on its classifieds section is attributed to oodle.com and not to Wal-Mart, since the classifieds resides on oodle.com domain. Not a very smart move by Wal-Mart. Today Google announced, that the advertisers who run TV Campaigns via Google AdWords can track the online impact of those TV ads using Google Analytics. Impression Delivered is Total impressions delivered -- an impression is defined as an active television that is tuned to and displays your commercial for 2 seconds or more. Number of Ad plays – I am not sure what this means but this probably refers to total number of active televisions that viewed the entire ad. I will provide more information as I get more detials. So now you can start to see online, radio and TV ads all in the same reporting. Pretty cool!! Here is a screen shot of the report that you will get.